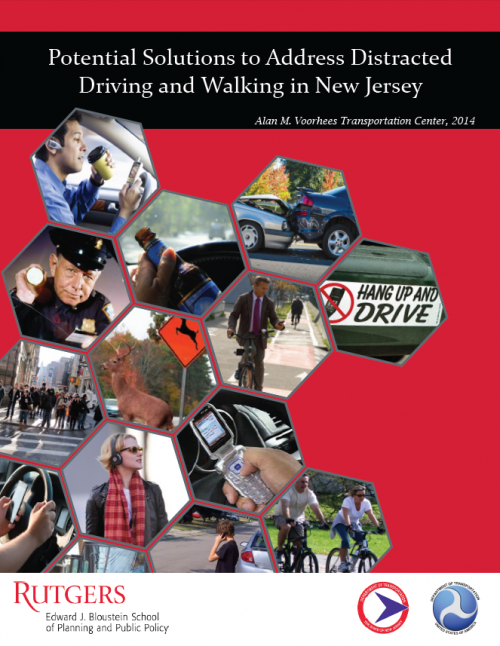 The objective of this report is to examine the perception of distracted driving and walking problems in New Jersey and to understand the extent of support for possible solutions. Distracted driving and walking have become more serious over the past decade, in some cases leading to crashes involving fatalities and injuries. In light of these emerging issues, the Alan M. Voorhees Transportation Center undertook a study that examined perception of distracted driving and walking and their solutions amongst three different groups of people: pedestrians (surveyed as they walked outside), police officers, and urban planning professionals. A total of 788 pedestrians, 156 police officers, and 209 planning professionals completed surveys. The responses show that all three groups believe distracted driving is on the rise in New Jersey. They also consider it to be a very serious or serious problem. Distracted walking is also thought to be more prevalent in recent years, but all three groups consider it to be a less serious problem than distracted driving. Among the different types of distractions while walking, texting while crossing streets is considered to be particularly unsafe.